Scouting for stonefish and eels among the fire coral 60-feet down, I get the signal from a member of our dive group that he’s reached 100 bars in his tank. It’s time to turn around. According to the bezel on my IWC Aquatimer Chronograph, we’ve been swimming for 25 minutes. With a slight current behind us, we’ll make it back in 20. I give the bezel a twist to align the zero marker with the minute hand and indicate to the group that we’re headed back. We follow the reef, ascending gradually. I check my watch regularly and after 15 minutes, we’re at 20 feet, looking for the landmark — a crumbling, old concrete pier footing — that means it’s time to turn toward shore. I spot it and we angle in, lingering at 15 feet for a precautionary decompression stop before popping up into the bright sunlight. I stop the chronograph and double check my dive computer against it. Total dive time: 59 minutes. Another fantastic hour spent underwater in Bonaire. The bright yellow minute hand and the 15-minute indication on the bezel help maintain the level of readability necessary for a diver to keep track of his dive time. Bonaire, the lesser-known sibling of Aruba and Curaçao in the Netherlands Antilles, is a scuba-diving mecca. In sharp contrast to the island’s stark, arid landscape, which is spiked with cacti and populated by wild donkeys and iguanas, its offshore reef is a lush world of kaleidoscopic coral and teeming with fish of every size, shape and colour. Discovered, as were so many other great dive spots, in the 1960s, Bonaire is a diver’s dream, not only because of its healthy reef system, but also because of its accessibility from shore. 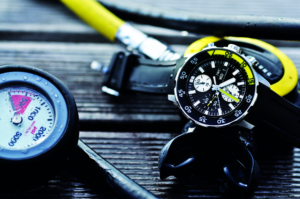 It also proved to be a perfect environment in which to test out IWC Schaffhausen’s Aquatimer dive watch. I went to Bonaire for a week in June with a small group of friends, a duffel bag full of dive and camera gear, and a brand new IWC Aquatimer Chronograph (ref. 3767). Underwater, the chronograph functions perfectly, and can also be operated. While IWC was relatively late to the dive watch arena, only introducing its first Aquatimer in 1967, it has, arguably, a stronger heritage of innovation than many of the other big Swiss firms. Its first, the reference 812, didn’t really break new ground, but after some dormant years, the company’s dive lineup really hit its stride in the 1980s when it introduced the Ocean 2000 in collaboration with Porsche Design. Developed for the German navy’s divers, the Ocean 2000 was the first dive watch to be made from titanium and was water resistant to a staggering 2,000 metres, impressive even to this day. The mine-clearance diver’s version was the first completely amagnetic wristwatch and its technology is still a closely guarded secret. In 1999, IWC again broke ground with its Deep One, a mechanical diver with an integrated depth gauge. Cult favourites like the GST Aquatimer (ref. 3536) and the Aquatimer Split Minute Chronograph followed, and in 2009, the company boldly redesigned the entire line to its current iteration. The ref. 3767 chronograph is a showcase for IWC’s Aquatimer reboot. The divers are a significant departure from the previous generation of Aquatimers, which were well loved for their Teutonic styling, internal rotating bezels and titanium cases. IWC chose to go with bolder design cues, a more conventional external bezel with a luminous sapphire insert, and eschew titanium as a case material. The new Aquatimers use a new quick-release strap-retention system (licensed from Richemont sibling, Cartier) and are available with a steel bracelet, a rubber strap or a hook-and-loop dive strap. I chose to take along the rubber and hook-and-loop straps, both in the optional extra-long size for better fit over a dive suit sleeve. For the modern diver, a wristwatch is something of a vestigial anachronism despite the hyperbolic copy and dramatic photography that pepper watch company websites. 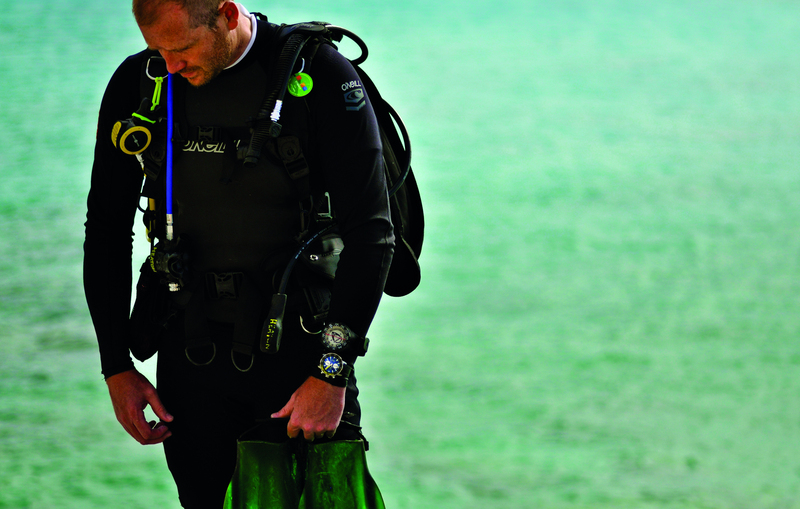 Sophisticated digital wrist computers are the norm for all but the most Luddite of divers, who still rely on memory and math skills to calculate their no-decompression times. But in Bonaire, a dive watch remains a useful instrument, mainly due to the nature of the diving itself there. While most dive destinations mean packed cattle boats on strict schedules dumping tens of divers onto overrun reefs, Bonaire is diving as it must have been in the early days. You drive down the lonely coastal road until you find a suitable entry point, park on the rocky beach, gear up and wade into the blue Caribbean. No divemaster, no schedule, no crowds. Just swim out to the reef, descend, and swim until your air runs low before you emerge into the hot sun to go do it again. While the diving is easy, the trick is in the navigation since getting back where you started is of primary importance. To do this, a watch is a useful, if not vital, piece of equipment. Being able to time your underwater swims using the chronograph or, more easily, with a rotating bezel, means a diver can concentrate on the scenery instead of trying to recall how long he’s been swimming. The Aquatimer Chronograph’s new quick-release strap system allows one to easily change between the rubber and nylon straps for diving. Some diehard IWC fans were disappointed with the move to an external bezel on the new Aquatimers, favouring the internal bezel that was a hallmark of the previous edition. However, I found the new design far more useful in real-world diving conditions. I had a chance to dive with the previous generation Aquatimer (ref. 3548) on a wreck dive in cold Lake Superior. The crown that adjusted the internal bezel proved very difficult to operate wearing 5mm gloves. Though the crown was not screw-down, it was pressure-sealing, so that as depth increased, the gasket would become more watertight. The downside of this approach was that the bezel could not be adjusted below about 20 feet, thus preventing use at depth for timing underwater activities. Sadly, after surfacing from a 125-foot dive, I found that my Aquatimer’s crystal had fogged due to a gasket leak. So moving to an external bezel design for the new Aquatimers was a welcome change and I was eager to put it to the test in Bonaire. The steel bezel is chunky and firm, easy to grip with wet hands. The action is just right, not requiring too much effort to turn, but firm enough to resist accidental movement. The sapphire insert proved highly legible in all conditions. The yellow first-quarter segment and subsequent numbers stay highly visible even to a depth where all other colours go grey. On a night dive, luminescence was spectacular, with the markers shining blue, and the bezel and minute hand, yellow. Tracking the minute hand against the bezel made for easy dive timing. IWC’s new quick-release strap system is nothing short of brilliant. I alternated between the rubber strap for topside wear and the nylon hook-and-loop (more commonly known by the trade name Velcro) strap for most dives. Strap changing took mere seconds with no tools necessary. It was particularly nice after diving to swap out the strap and let the nylon dry while wearing the rubber. Both straps easily fit over my 2mm wetsuit sleeve, but the long nylon strap would be my choice for wearing over a thicker cold-water exposure suit. The rubber strap is pliable, but tended to chafe my skin a bit in the hot, sticky topside conditions of Bonaire. The steel bracelet would have been a good option. 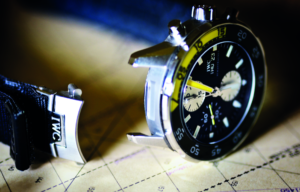 With IWC’s strap and bracelet choices, in different lengths, there is little reason to miss aftermarket strap choices. Jason Heaton with the Aquatimer Chronograph strapped to his wrist, fresh out of the water and decked in full diving gear. The red gold version (ref. 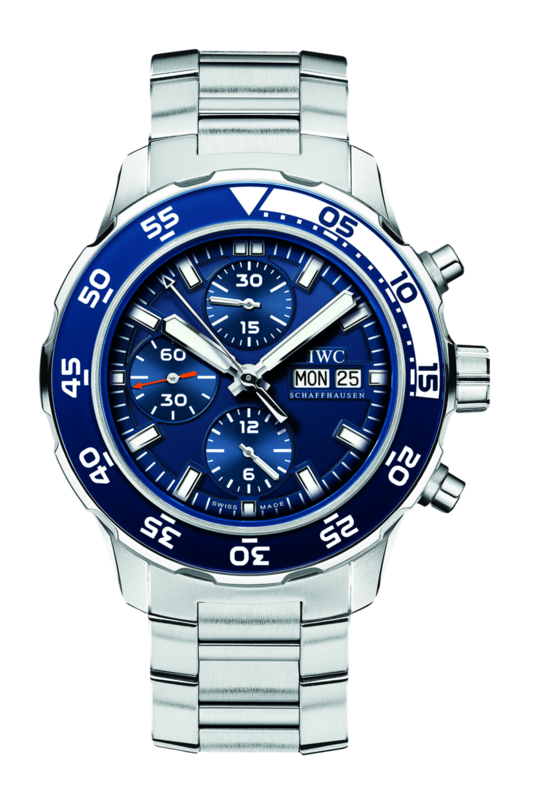 3769) of the Aquatimer Chronograph houses IWC’s excellent in-house cal. 89360 movement. However, the steel model I tested uses the more pedestrian 79320 movement, which is derived from the ubiquitous Valjoux 7750 family. While I love a manufacture movement, in a working dive watch without a display back, priority is on proven durability and accuracy rather than innovation or decoration. IWC does some modification to the movement, the extent of which is not discussed outside of Schaffhausen walls. But timing on my watch was excellent regardless. IWC does not submit its movements for third-party chronometer certification, but mine ran a consistent +2 seconds per day through very vigorous 24-hour wrist time. 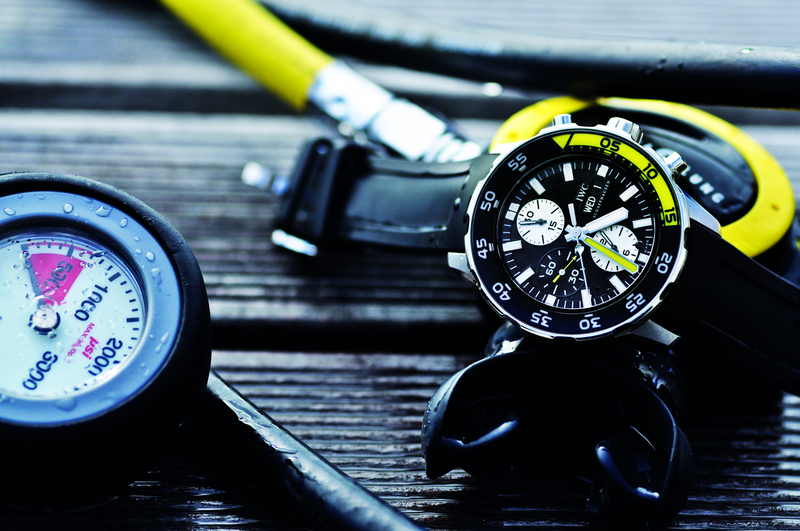 It is debatable how useful a chronograph is for diving. Timing using the bezel is much more easily readable at a glance. But for tracking events like underwater decompression stops, or for surface intervals (time between dives), it could be useful, and the Aquatimer Chronograph’s contrasting silver subdials heighten legibility against the black dial. Of course, the Achilles heel of dive chronographs is the existence of two more holes in the case, which are possible points of water entry. But while the Aquatimer Chronograph is “only” rated to a modest 12 bars of water pressure (the equivalent of about 120 metres, or 400 feet), this rating includes the full utilization of the chronograph functions, thanks to a sophisticated gasket system that prevents water entry. Despite this assurance, I was skittish about using the pushers at depth, and most of the time opted to use the chronograph to track total dive time, starting it prior to descent and stopping it upon surfacing. Despite the abundant design changes to the new Aquatimer Chronograph, it is still an IWC through and through, evident in some distinctive visual cues. The case, though two millimetres larger in diameter than the previous version, retains the angular, wrist-hugging lugs and slab-sided flanks. The convex crystal, with its anti-reflective underside, reflects a blue hue in sunlight, while virtually disappearing underwater. The yellow minute hand and bezel arc are reminiscent of past Aquatimers, as is the crown, which sits naked, sans shoulders, between the pushers. The caseback is spare, with minimal text and no sea-creature engravings. The overall effect is still unmistakably IWC: clean, Germanic and utilitarian. After spending almost a full day (22 one-hour dives) underwater over the course of a week, the last day was spent off-gassing nitrogen from our bodies, and drying and packing gear for the long flight home from Kralendijk’s Flamingo Airport. The Aquatimer Chronograph’s rubber and hook-and-loop straps had become a bit faded from the sun and saltwater, and the case had a couple of new blemishes from knocks on tanks and equipment. 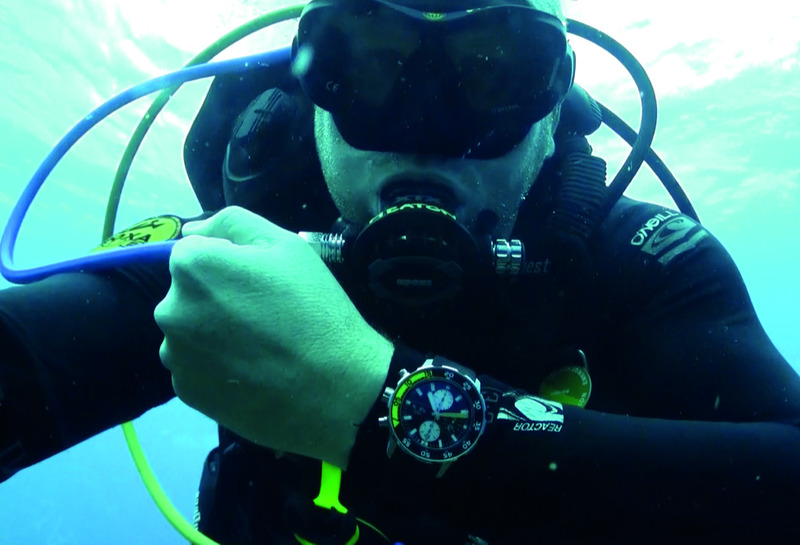 While most watch companies have a dive watch in their portfolios, few see real underwater action, despite lofty specifications and ad copy. 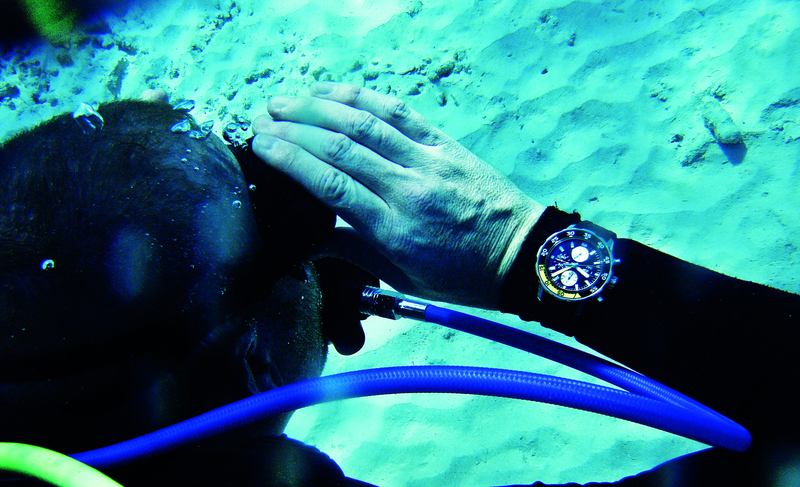 But beyond the engineering reports and pressure tester, real-world diving remains the best way to evaluate a watch, with the insidious effects of sun, sand and saltwater, depth, accidental knocks, as well as the simple requirements of the wearer for legibility, durability and accuracy. Having strapped on many different watches over hundreds of dives, I can confidently say that the IWC Aquatimer Chronograph is among the best of breed. So even if its owner never wears it beyond the bathtub, he can be confident it’s up to the task. IWC calibre 79320 self-winding movement, 44-hour power reserve, 44mm case in stainless steel, water resistant to 120m, Rubber, nylon, or stainless steel bracelet.